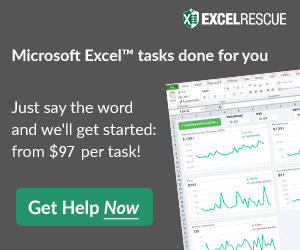 If you think your Excel project will take an expert less than four hours, Excel Rescue solves small tasks for a flat fee. Tiny answers are FREE! Projects under 1 hour are $79. Projects under 4 hours are $199. Excel Rescue is fast, secure and offers a money back guarantee. Data visualization: creating or updating graphs, charts, etc. Contact Excel Rescue for your small Excel Consulting projects.